OVERVIEW: This book is part of a series of ‘Secret Coder’ books, introducing children to the world of coding through comic-book style illustrations. DESCRIPTION FROM THE PUBLISHER: Stately Academy is just crawling with mysteries to be solved! In the last volume, Hopper and Eni discovered a robot in the supply closet and programmed him to do mischief. Now they’re trapped in an underground lair, and they must use their new programming skills to escape. Hot on the heels of the highly anticipated first volume, Paths & Portals offers more of the same high stakes adventure and real world coding instruction. 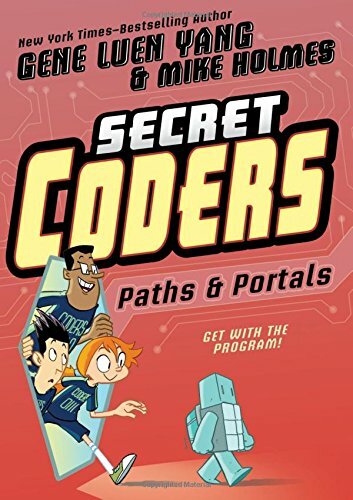 The Secret Coders series is an exciting new direction for Gene Luen Yang, one of the most popular creators in children’s comics.